. . . "Distant Light" juxtaposes a luminous new song-cycle by the Swedish composer Anders Hillborg with Barber's evocative "Knoxville: Summer of 1915" and orchestrations of three songs by the idiosyncratic Icelandic diva Björk, and has completely bewitched the Presto office . . .
Radiant Renée triumphs in both Barber and Björk . . . Fleming shows with this ambitious album that she is far from renouncing musical frolics . . . there's quintessential Fleming repertoire on it -- a gorgeous performance of Samuel Barber's "Knoxville: Summer of 1915" . . . What's most important is that Fleming, 58 next month, still commands the creamiest, spine-shiveringly sensuous timbre in the business. That's evident throughout Knoxville, as is her excellent diction . . . There's a much more ghostly atmosphere in Hillborg's writing, though, with especially effective use of shimmering string clusters. And he also supplies a vocal line tailor made for Fleming, with opportunities galore for her to soar above the stave like some majestic ocean liner riding the gentle swell supplied by the Royal Stockholm Orchestra . . . The amazing thing about the three Björk covers she includes here -- "Virus", "Joga" and "All is Full of Love" . . . is that this originality of melodic line and harmony is preserved, while the idiom is gracefully transformed into that of the romantically orchestrated art-song . . . I was transfixed by the lushness and emotional richness. In his song-cycle "The Strand Settings", Anders Hillborg shows how well music can enter this dream-like world where emotions and nature intertwine. At once alluring and uneasy, the songs are a gift for Renée Fleming, whose siren-like soprano draws the listener on to the unknown. The atmosphere is potently captured by Sakari Oramo and the Royal Stockholm Philharmonic Orchestra.
. . . as a vehicle for the soaring purity of Fleming's voice, and as an evocation of Strand's very finely etched sensibility, Hillborg's settings are genuinely beautiful and their cumulative effect is powerful . . . There's more ravishment and vocal refinement in the work that precedes the Hillborg too . . . ["Knoxville: Summer of 1915"] is one of the most transcendentally beautiful of all 20th-century vocal works, and tailor-made for a voice of Fleming's radiant purity. She sings it with just the right mix of fond nostalgia and uncomplicated descriptive directness, while Sakari Oramo and the Royal Stockholm Philharmonic provide discreetly evocative accompaniment . . . [the orchestral arrangements by Hans Ek of Björk's] "Virus", "Jog" and "All Is Full of Love" are immensely skilled, and the last of them, in which Fleming duets with herself, is not a million miles away from the soundworld of Hillborg's cycle. Fleming obviously relishes the atmospheric music that Hillborg provides for her, and her soprano sails and swoops through the generally wistful and gossamer textures that the orchestration provides . . . Her tone is still refulgent and capable of soaring through generously arching paragraphs, so Samuel Barber's "Knoxville: Summer of 1915" also provides a congenial vehicle for Fleming . . . Sakari Oramo's conducting teases out all the lush strands and textures his composers offer . . . This delightful, vibrant new release "Distant Light" finds her drive early on by placing her mark on Samuel Barber's "Knoxville: Summer of 1915, op 24" . . . then flows beautifully into several compositions that truly sound composed specifically for her. These are Anders Hillborg's "The Strand Setting" (20 minutes) and they truly allow Fleming to showcase her incredible musical attributes. Her voice is so professionally supported by the Royal Stockholm Philharmonic Orchestra and Sakamo Oramo. Indeed, and at this stage of her career, why not, but she seems so comfortable with herself and this improves the richness of her voice. This stunningly-crafted album then rounds out with some classical arrangements of contemporary works from, of all unexpected artists, Björk . 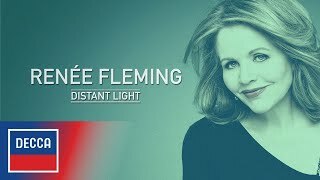 . . Fleming's artistic freedom to explore so much on one recording is stand up and applaud fantastic and the fact that Decca continually allows her (or commissions her even) is tantamount to creative genius -- on both their parts. Fleming's lustrous voice illuminates the gorgeous textures and yearning for the past of Barber's "Knoxville: Summer of 1915", and conductor Sakari Oramo and the Royal Stockholm Philharmonic Orchestra come to the forefront with the brittle sounds of Hillborg's haunting "The Strand Settings".
. . . a daring mix of music . . . transformative performances of three songs by Icelandic phenomenon Björk in specially commissioned orchestrations by the brilliant Swedish composer and arranger Hans Ek, recorded here for the first time. Fleming also gives a radiant, sensuous performance of Samuel Barber's beautiful masterpiece "Knoxville: Summer of 1915" -- one of her most requested pieces. Fleming is in her best voice for Hillborg, sometimes digging into her lower range with great effect . . . [and employing] breathy mannerisms to characterise awed disbelief at the visions at hand . . . the mannerisms are undeniably effective . . . Fleming finds much to connect with in the rhapsodic repetitions of "Jóga" . . . [for the Hillborg alone, this disc] is worth the price.
. . . [this disc's triumph is clearly] Anders Hillborg's "The Strand Settings" . . . [composed for the creamy soprano of Renée Fleming,] the piece already seems a classic with its declamatory vocal ardour, orchestral finesse, and communicative confluence of styles . . . As she soars upwards on words like "stars" and "freedom" -- Hillborg's not afraid of the obvious -- Fleming's top register seems as golden as ever . . . Oramo and his Stockholm musicians couldn't be more loving . . . [the Björk song] "Virus", bubbling like the original with gamelan-like sonorities, offers the most fun.
. . . [Ms. Fleming gives us a terrific and emotional performance of the Barber], and the Decca engineers have given us a very nice sounding CD . . . [Hillborg]: Ms. Fleming does well with this difficult and atmospheric piece. The Hillborgs is a world premier recording . . . [the Björk songs] are highly original and personal works, and Ms. Fleming and Björk have a musical connection in that both won Sweden's Polar Music Prize . . . this is a very fine CD of her music. I think the Barber alone is reason to buy this, and the other pieces are simply further enticements. Highly recommended! [Hillborg]: Much is recitative, delivered over gossamer textures of great beauty, punctuated with dazzling orchestral punctuation from a true craftsman. Fleming is in great voice and makes the strongest possible case for the piece, and turns in a masterfully judged account of Barber's lyric rhapsody.
. . . imaginatively programmed . . . [Barber / "Knoxville: Summer of 1915"]: Fleming sails through the piece in liquid voice, passionately . . . with languorous phrasing . . . The Royal Stockholm Philharmonic, led by Sakari Oramo, lays down as smooth and velvety a backdrop as one would want . . . [Hillborg / "The Strand Settings"]: a dazzling yet lonely-sounding setting of four poems . . . Fleming is completely inside the text, dramatizing everything . . . [for the Björk songs, Fleming brings out] her pop voice . . . the operatic timbre suppressed, but not her dramatic flair. Again, she pulls it off convincingly . . . Especially good is Fleming's cover of "Jóga"; its haunting refrain, "State of emergency/How beautiful to be," will stay with you long after the CD runs its course.
. . . ["Distant Light," showcases Fleming's] versatile artistry . . . the diva brings her luscious voice and searching expressivity to "The Strand Settings" . . . and the result is luminously beautiful -- diaphanous surfaces clearing away every so often to reveal dense, pungent chords and restless harmonies underneath. There are first-rate accompaniments by the Royal Stockholm Philharmonic under Sakari Oramo.
. . . a coherent and convincing recital programme . . . Fleming still has one of the loveliest voices in the business, and that blooming tone is celebrated not only in the Barber but in Hillborg . . . lovingly performed here by Oramo and the Royal Stockholm Philharmonic . . . If the tone feels more manufactured in the three Björk tracks, it's not unpleasantly so. Together they make a natural ending to a programme that quietly dissolves divisions between genres to rather wonderful effect.
. . . a radiant recital . . . [in Barber's "Knoxville"] she hits the high note impeccably . . . [and displays her] uniquely lustrous tone . . . the orchestral accompaniment by Sakari Oramo and his Swedish forces ranks as the best I've ever heard, captured in excellent recorded sound . . . What really sells the Björk songs are the adroit, colorful arrangements by Swedish composer-conductor Hans Ek, whose cross-genre approach gives the orchestral part as much mood and atmosphere as we hear in the Hillborg cycle . . . [this album's program is] a world of remembrance and desire that floats ethereally above the mundane . . . I find it a total success.
. . . [a] fine collection . . . [Barber]: [Fleming is] impressive, and has the advantage of rich orchestral sound beautifully recorded. "The Strand Settings" komponierte der Schwede Anders Hillborg Renée Fleming auf ihren leuchtenden Sopran: Unter die ausdrucksstarke Deklamation legt er zumeist Klangflächen von berückender Schönheit, aus denen sich bisweilen einzelne Phrasen herausheben wie Seezeichen aus einem Meer des Klanges. Renée Fleming war selten besser als in den Stücken dieser CD. Das Royal Stockholm Philharmonic Orchestra begleitet sie unter Sakari Oramo, der eine überzeugende Relation herstellt zwischen dem Gesangsstar und dem symphonischen Anspruch der Werke.
. . . la juxtaposition fonctionne plutôt bien . . . [dans "Knoxville: Summer of 1915" de Barber, Fleming] incarne chaque syllabe avec sincérité, sculpte des phrases généreuses . . . [Hillborg / "The Strand Settings"]: superbement orchestrées . . . La voix se détache sur ces nappes moirées et cultive un ton constamment lyrique . . . La musique s'anime dans le troisième volet, "Dark Harbor XXXV", propulsé par la walking-bass qui soutient des motifs syncopés aux accents jazzy. Une occasion supplémentaire pour l'Orchestre de Stockholm et son chef de se couvrir de gloire.